The Dark Turtles are clones of the NinjaTurtles created by Sh’Okanabo, but are under control of Darius Dun. 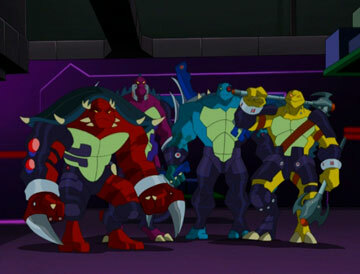 They made their first appearance in Fast Forward during the episode “Bad Blood” in which Dun set up a trap using them to destroy the Turtles. Quickly apprehending their weapons, they found it easy to defeat the turtles, capturing them and taking them back to their lair. Unfortunately for them, Cody Jonessought out his friends and helped the TMNT to take down the Dark turtles. Their lair is uncannily similar to the Turtles’ second lair in the series, only it seems more corrupted and dark. This resembles the fact that they themselves are corrupt versions of the TMNT. The second time we see them is in “The Fall of Darius Dun”. They were used as a distraction by Dun so the Turtles couldn’t go and help Cody. This time, instead of facing their counterparts, the Dark Turtles find themselves facing another of the Turtle brothers. Mikey’s clone faces Raphael, while Michelangelo faces Raph’s clone. Don’s clone is easily deceived by Leonardo. Later, Leo’s clone is ganged up on by all of the turtles, but is defeated by Donatello who uses a large forklift to do so. After being defeated, they flee, taking Dun with them. They explain to Dun they found him unconscious and brought him back with them so he wasn’t found and arrested. The final time we see the Dark Turtles is in the episode “DNA is Thicker than Water.” We quickly learn that where they live, they must scavenge for food, quickly followed by fighting each other for it. After being reprimanded by Dun for not defeating the Turtles, he reveals he placed a hypnotic suggestion in them so none of them can hurt him. Throughout this episode, it focuses on Dark Leo and how he begins to have second thoughts on how him and his clone brothers live compared to their originals. At the end, we see they may have hope as he shares the steak Darius gives him with the others. Due to the cancellation of the second season of Fast Forward, the Dark Turtles (along with Darius Dun) never got a real ending so no one can be sure what happened to them. Dark Leo also thinks about working with the original turtles, but he is not sure.